The iPhone XS has a camera that can be used in a broad range of locations and for a variety of purposes, with Smart HDR and improved bokeh mode useful in many different settings, but you wouldn’t think to take a picture with the iPhone underwater. That may not be the case for much longer. According to patents filed by Apple, and discovered by Apple Insider, a future Apple device like the iPhone 11 could have AI systems to optimize pictures taken underwater. The systems would recognize when the camera was used underwater, and then measure factors like the amount of ambient light, murkiness of surroundings and distance to subject, in order to subtly alter the picture to make it look as good as possible. What will iOS 13 bring to the table? What 5G phones are we expecting to release in 2019? This feature sounds like ‘scene optimization’ which we’ve seen in a variety of phones, most recently the Samsung Galaxy S10, which detects the setting of a photo and subtly tweaks the camera settings to take the best picture. A patent being filed isn’t confirmation that a feature will be present in an upcoming device, but we’ve actually heard about the iPhone 11’s waterproof features before. 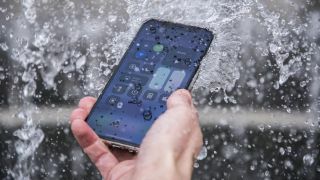 A leak suggested the iPhone 11 will be able to detect your touch even when it’s wet or submerged in water, which would solve the main problem for underwater photography. The iPhone XS is IP68 rated, which protects it from dust and immersion in water up to a depth of two meters for 30 minutes. That’s arguably good enough protection for an iPhone designed with underwater photography in mind. We’ve heard other rumors of the iPhone 11 camera, including the fact that it’ll be a tri-lens setup that’ll include a wide-angle lens, which we haven’t seen in an iPhone before. If Apple sticks to its usual annual schedule, we expect to see the iPhone 11 launched later in the year, but that doesn’t mean we haven’t seen a procession of leaks about the device, so keep checking back to find out the latest news and rumors surrounding the device. Why aren't all our smartphones completely waterproof by now?